I am an akuma (demon), and a shitsuji (butler). I guess it must have a pun meaning, too. On one occasion, a bad guy cried out "a-a-akuma? ", but that's the exception: everybody seems cool after hearing it. How can Sebastian say this so casually? I'm a devil and a butler, you see. I'm a butler through and through, you see. 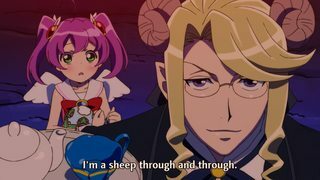 The fellow on the right was transformed from being a sheep to a (human) butler, and so instead of saying aku made shitsuji desu kara "I'm a butler through and through", he says aku made hitsuji desu kara "I'm a sheep through and through" (butler = shitsuji, sheep = hitsuji; cf. What do the sheep dolls represent in Mayo Chiki?). Additional note: the aku in the two examples are homophones that mean different things. The aku in my first example is 悪, which means "evil". The aku in my second example is 飽く, which is a verb meaning "to grow tired of" (you see its more common synonym 飽きる = akiru more often). The compound construction aku made (飽くまで) means "until I grow tired of ~" when viewed as two different words, and means "completely" or "thoroughly" when viewed as a fixed idiomatic compound (this latter usage is standard; analyzing it as a verb+まで is not). The official English translation by Funimation aptly captures the meaning and magnitude of this pun by translating it as "You see, I'm merely one hell of a butler." This reflects both his demonic nature as well as his skills as a servant using a common English expression that has more or less the same meaning. Not the answer you're looking for? Browse other questions tagged japanese-language black-butler or ask your own question. 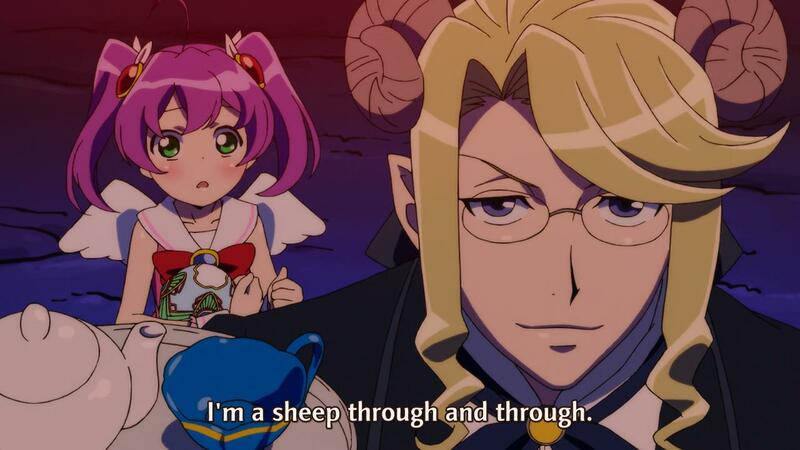 What do the sheep dolls represent in Mayo Chiki? Why did Kuroshitsuji II use new characters and plot? When and how did Claude take a part of Ciel's soul? What's up with the Black Butler intermissions? Where can I find and watch Black Butler Season 3 Episode 1 legally online? Why did the Black Butler anime diverge from the manga? Ciel and Elizabeth after episode 12 of the second season? How does Shingo's use of “osu” in this particular dialogue differ from its use elsewhere? Why is there an exclamation mark between 'Butler' and 'Grell'? When does Black Butler take place?